← Tomorrow’s Parma … Tonight!!!!! The Verdict: The Chicken Parmigiana at the Albion Hotel is another middle range parma that is good for a sneaky mid week feed but hardly one you would be demanding your friends come out with you to share. The high quality of the chicken breast and the chips was militated against by the misshapen way the parmigiana had been put together, the small and wafer thin ham and the insipid salad. This week’s chicken parmigiana was imbibed at the Albion Hotel in the inner Brisbane suburb of Albion (funnily enough). I had originally intended to try this parma out on Wednesday night but a cursory examination of our fridge at home revealed that we would be eating air for dinner if we did not go out and that is a good enough reason as any to go for a pub meal (as if a reason was needed). Chicken: This chicken breast was really well done. It was largish but thin and had been well cooked. My only criticism of it was that it was a bit too well crumbed for my liking. Just about every bite I felt like I was biting through gravel to get the chicken breast. Once one got the chicken though it was cracking. Tomato Sauce: The menu described this sauce as a Napoli sauce and it certainly was a tasty one. The problem I had with sauce was that it was fairly haphazardly put onto the chicken breast. In some places there was not enough of it for my liking and in other places the distribution was perfection. Ham: Have you ever purchased one of the 70 cent loafs of bread from Coles? You know the bread that you could hold up to your TV and still watch the cricket clearly through it is so thin? The ham on this chicken parma was of similar thinness. That disappointment was compounded by the lack of it as the photo above clearly shows. When there is almost an inch of chicken breast uncovered around its circumference because of the size of the ham used there is, in my view, simple not enough ham! Cheese: Bobo’s pizzas in the TV series Fat Pizza were supposed to be “big and cheesy” but rarely were as described and this chicken parmigiana whilst big certainly wasn’t not cheesy enough for my liking. Again, hark back to the photo above: I have more hair on the top my fast balding head than this chicken parmigiana had cheese in places. Side Dishes: The chips that came with the Albion Hotel parma were really very good. Crisp and hot = enough said. The salad was just a bit of old lettuce thrown together with onion and tomato. This is normally the type of salad I like, with the exception of the tomato, but the fact that the tomato wedges were bigger than the orange wedges you would see on the side of the field at an under 8s football game meant they overpowered the other items. The dressing was almost non-existent. Presentation: Yet again I was served a chicken parmigiana with the chicken part resting, in part on the chips. I have said it before and I will say it again: I HATE THIS. Fair dinkum is there a shortage of large plates going around the pubs of Brisbane at the moment because meals just seem to be squashed onto plates. Size: This was a largish chicken parmigiana. The Final Word: I have asked myself the question “would I recommend this parma to my mates?” and the answer is “yeah, if your cupboard is bare and you are in Albion”. Enough said really. Gents you will need to go to the toilet before sitting down. The running water feature across one wall will, if you do not void before hand, tell your bladder that it is time to go about 5 minutes into your meal. If the feature was meant to drown out the road noise it failed: it just sounded like the running water of a urinal. We do not have any children but are usually more than comfortable with children in restaurants. Not so tonight though as the fascination of the water feature became too much for one young child who put on a long and resonant turn. This child is lucky to have not ended up in the water feature at our hand because the enclosed nature of the outdoor seating area meant that the noise just got louder and louder as the child became more distressed. 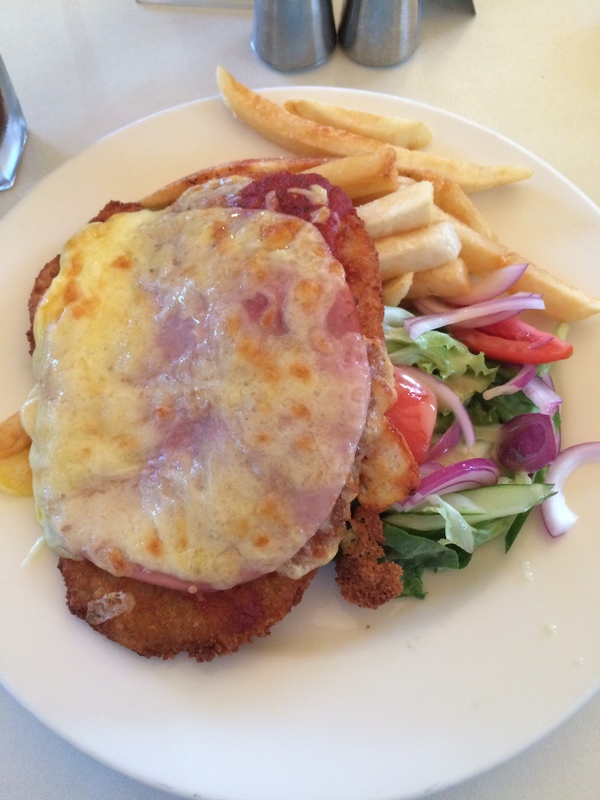 This entry was posted in Uncategorized and tagged Albion Hotel, Brisbane, brisbane eats, brisbane's best parma, chicken parmigiana, Parma. Bookmark the permalink. Fair play with your review there, presentation of the parma looks amateurish as if one piece of thin sliced ham were laid down on top and then that part covered with cheese and sauce.